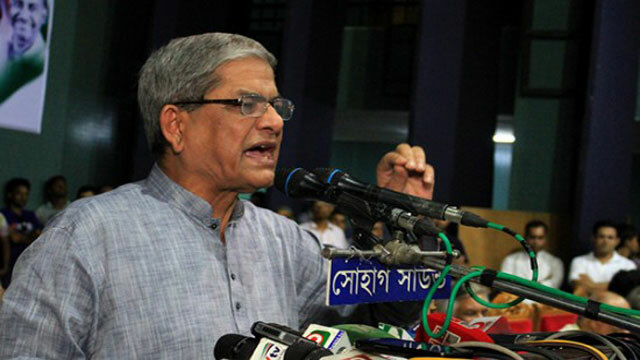 Dhaka, Dec 6 (Just News): BNP secretary general Mirza Fakhrul Islam Alamgir on Wednesday alleged that the repression and cruelty of the current government have outshined autocrat HM Ershad's rule. "Autocrat Ershad, against whom a mass upsurge had been forged in the 90s, was not even so bad. At least they had courtesy that they didn't open fire on the public rallies. But there's no estimate of how many people were killed by the current government and how many children became orphans," he said. The BNP leader came up with the remarks at a discussion programme arranged by pro-BNP student leaders of Ducsu and All Party Students Unity (Apsu) of the 90s at Dhaka Reporters Unity (DRU), marking the Fall of Autocracy Day. On December 6, 1990, military dictator Ershad stepped down in the face of a mass upsurge and handed power over to a caretaker government ending his nine years of autocratic rule which began through grabbing power in a coup on March 24, 1982. Fakhrul said the government has long been seriously repressing BNP leaders and activists and sending them to jail implicating them in false cases. He said the government has made huge people disappeared over the last 6-7 years. "No one is now safe in the country. You (government) have distorted the history and obliterated people's democratic rights." The BNP leader called upon the government to arrange a dialogue for finding out an effective way for holding the next election in a fair and credible manner. "There's still time that we can fulfill the hopes and aspirations of people through talks."